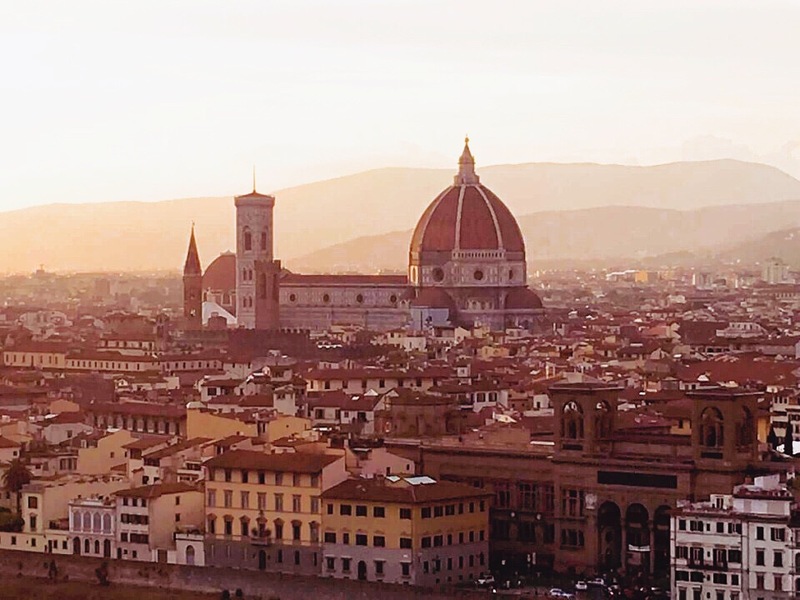 Have you ever wondered where travelers go to get those amazing, panoramic views of Florence? 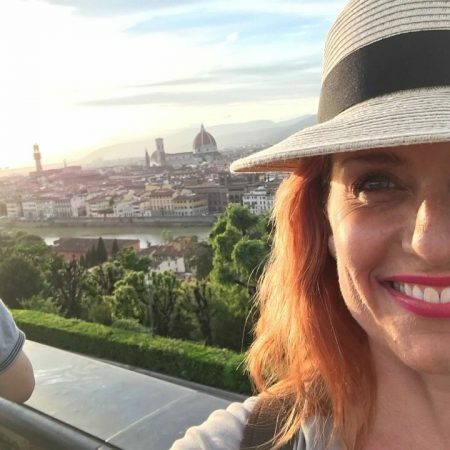 Where they take the postcard-like photos with the Duomo, the Campanile and the tower of Palazzo Vecchio standing out majestically against the beautiful backdrop of the city with the Arno river cutting through it? It just so happens that this place is the best spot in all of Florence to watch the sunset. 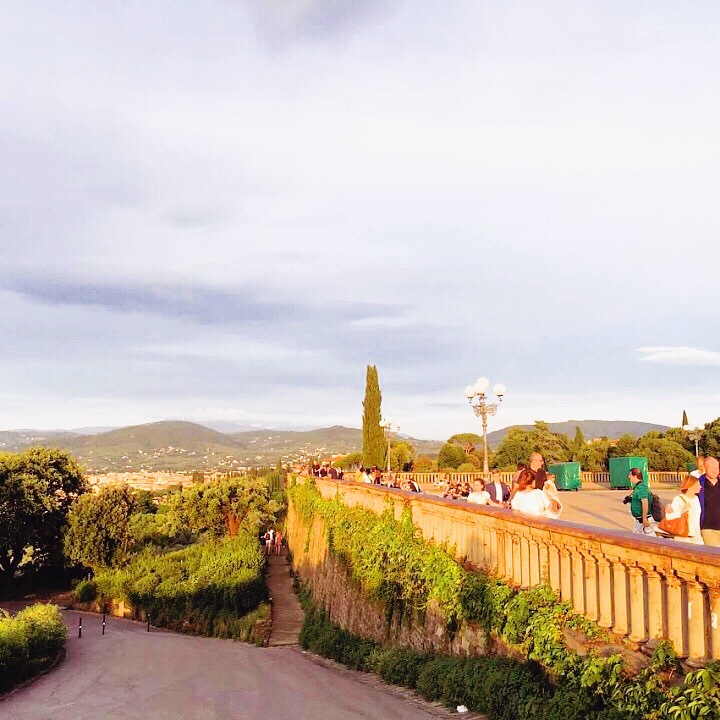 If you are in Florence at the end of the afternoon I recommend taking the 30 minute walk from the heart of town up to Piazzale Michelangelo. Plan to arrive half an hour before sunset so that you have time to look around, take in the views, and get some great photos. 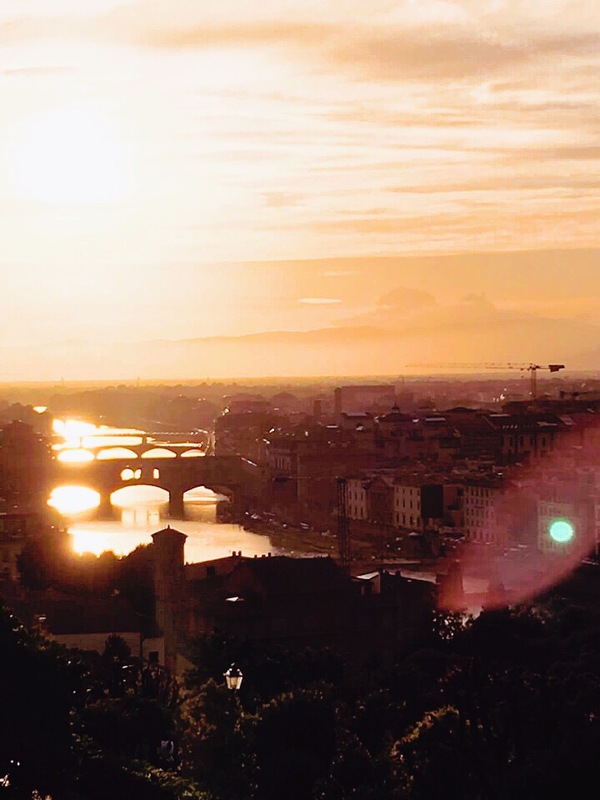 Alternatively, spend the late afternoon in Piazzale Michelangelo and then wander back down the hill and onto one of the bridges and catch the setting sun as it meets the Arno. It is such a beautiful sight – you will remember it forever! This is a square dedicated to the famous sculptor and painter. It has bronze copies of his work including the David. But perhaps more importantly it has the most beautiful, sweeping views of the city. Michelangelo’s Square is across the river from the Duomo in the Oltrano district, perched up on the hill. 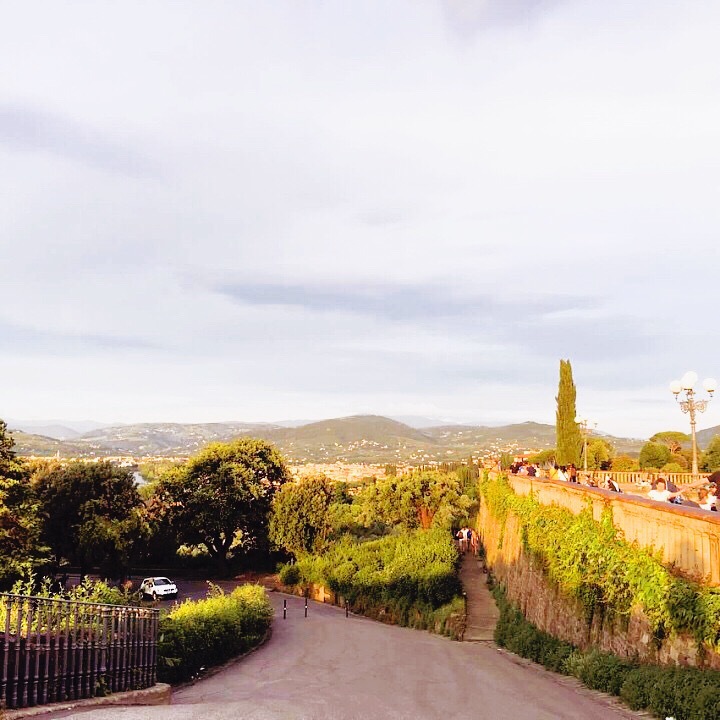 There are several ways to get up to Piazzale Michelangelo. My favorite is to walk. If you cross over to the south side of the Arno at any of the bridges you can walk parallel to the river (there are signs from Ponte Vecchio) heading upstream towards the Torre San Niccolo’, an old tower that was once part of the medieval city walls. It is easily spotted jutting up above the rooftops. Once you reach the tower you are actually directly under the piazza. You will see the staircases working their way up the hill into the park. Be prepared for some significant thigh burning as you head up there, but on the bright side you are earning dessert! 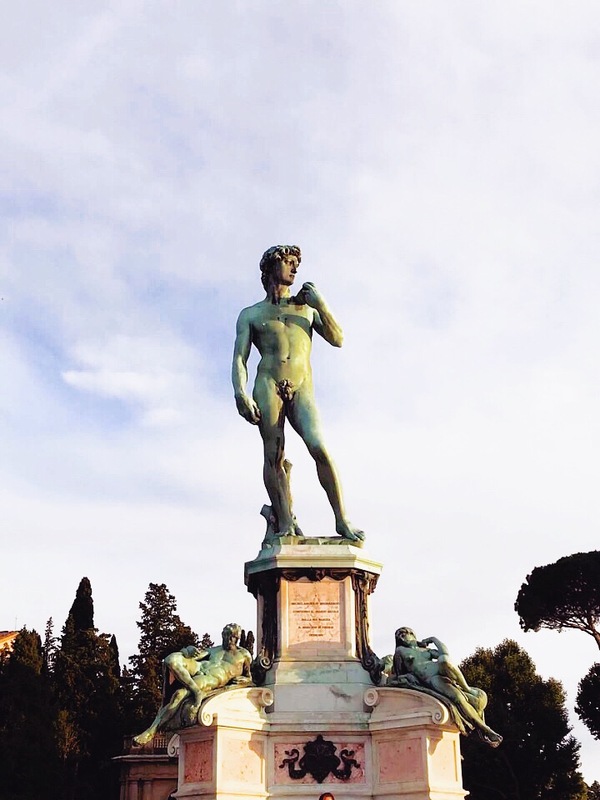 (Or burning off a hearty Florentine lunch…) Once you get to the top you will cross the street, take a small staircase and you will be in the piazza! Another walking option is from the Porta San Miniato. Go through the gateway and take a short but steep street to the beautiful old stone steps that will take you past the entrance to the rose garden and into the piazza. 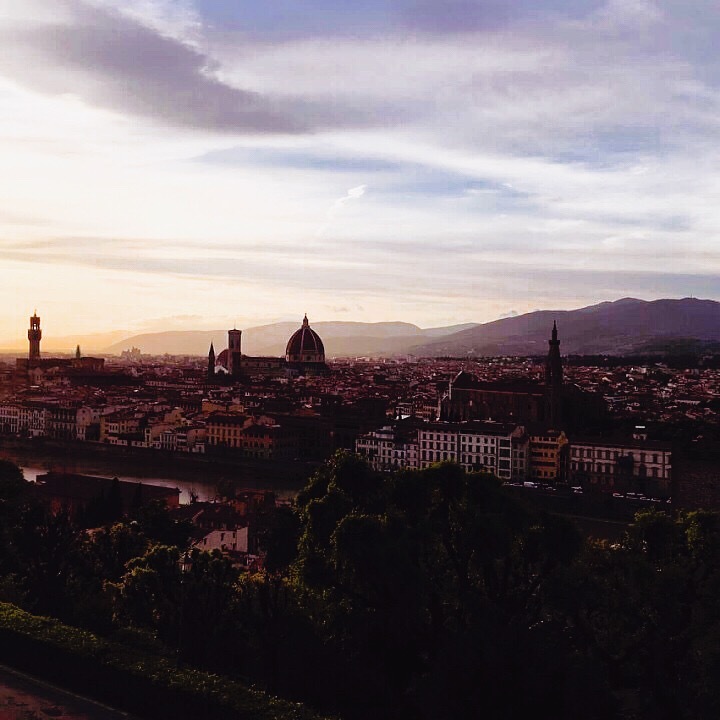 Whichever walking route you take, make sure you keep looking behind you as the panorama of Florence comes into view! Take the other route back down when you are done, so that you can experience both. If the walk seems like too much (there are a ton of stairs) another option is to take the bus. From the train station you can take the number 12 or 13 bus, which you will find by the taxi stand. You will need to buy your bus ticket at the tabaccheria first. The Hop On Hop Off bus goes to Piazzale Michelangelo too. Not in the mood for walking or taking a bus? It is a quick taxi ride up to the piazza. 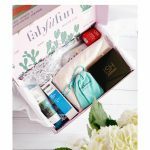 Next Post Traveling To Europe? 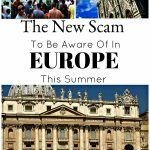 You Need To Know About This Scam!